As the holidays approach, everyone is looking for a special gift. Edible gifts are popular and give back to the food community. The gift of cheese is one way to give something that benefits the local community and is quintessentially Minnesotan. 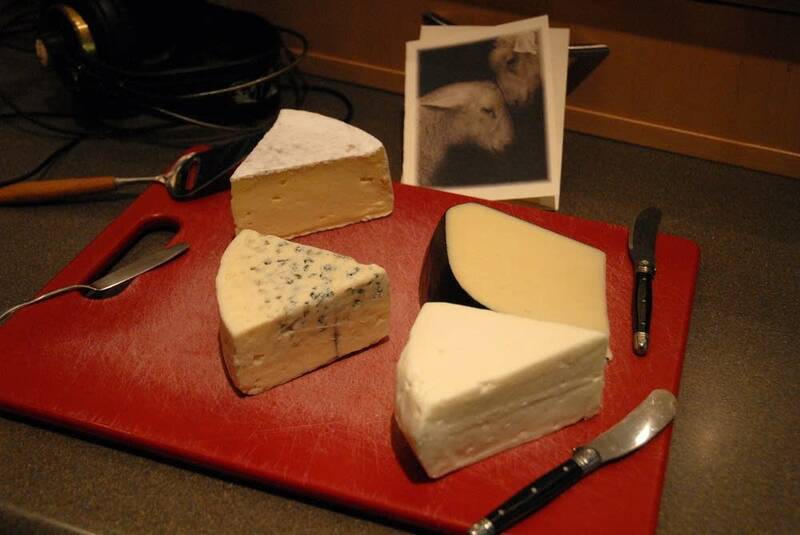 Dara Moskowitz Grumdahl from Minnesota Monthly talks with MPR's Tom Crann about cheese from Shepherd's Way Farms in Nerstrand, Minn.
Tom Crann: I understand there is a story behind these cheeses? Dara Moskowitz Grumdahl: Two stories! The first story is the simple story of great cheese: Steven and Jodi Read have one of the country's biggest dairy sheep farms in America, down in the beautiful rolling hills of Nerstrand, Minn., and their cheeses have repeatedly won top-place at the American Cheese Society's annual contest, making them officially some of the best cheese in all of North America. Crann: That sounds idyllic ... but there's another story? Moskowitz Grumdahl: Yes, a dark and complicated story, a story of arson and unsolved crimes. Back in 2005, in the dark of the night someone set fire to the barn where all the newborn lambs were. The mother ewes didn't want to leave their newborns, and in the end the Reads lost nearly 500 members of their 800 member flock. When they came out of that, they discovered that insurance wasn't going to pay for the cost of replacing what they had lost, and their milk production fell off a cliff. Once they sold through inventory they didn't have the actual milk to make the cheese to get back on their feet. They rebuilt using milk from other local shepherds. In a stroke of good luck the shepherd's cooperative that the Reads helped found a few years earlier is what got them through this rough patch. They got through that crisis and wanted to build a lambing barn, but ran right into the money crisis of 2008, They couldn't find a bank to lend to them to rebuild, and at the end of last year almost lost their farm to foreclosure. They started a nonprofit financial arm called Farmhaven, which solicited investors, and they have so many fans that they were able to save the farm. Now they're back to trying to get their lambing barn ready for the late-winter lambing season, and are selling cheese boxes. Crann: And how do you get these cheese boxes? Moskowitz Grumdahl: This coming weekend is the weekend for all the pre-Christmas holiday farmer's markets, so you can order them online and pick them up at either the Mill City Farmer's Market or St. Paul Farmer's Market, or if you want to get them later in the year they're available for pick-up at Lucia's or the Birchwood Cafe. • The Mill City Farmer's Market, inside the Mill City Museum, from 10 a.m. to 2 p.m.
• The St. Paul Farmer's Market, from 9 a.m. to 1 p.m.; remember that there are additional vendors inside Golden's Deli, across 4th Street from the main market. Golden Fig's Honey Basket: Vanilla spoon honey made with local creamed honey combined with vanilla beans, from Bare Honey, Wild sumac honey from Bare Honey, Honey-filled chocolate bon bons from Mademoiselle Miel, and a poster by John Vogt. Proceeds from the sale of the poster go towards researching colony collapse disorder at the University of Minnesota. Total price, including the poster and tax, is $62.16. Native Harvest Basket: The sustainable foods arm of the White Earth Reservation's Land Recovery Project sells some of the country's best wild rice and exquisite jams. Proceeds are used to help the native Ojibwe of the White Earth reservation in various ways, including to restore native food ways.